The desire for food is limited in every man by the narrow capacity of the human stomach; but the desire for the conveniences and ornaments of building, dress, equipage, and household furniture seem to have no limit or boundary. I have a problem. You have a problem. In fact, we all share a common problem. The problem is that we humans, being the imaginative beings we are, always want something more. No matter how well off we are, we always want something more. We always imagine that if only we had some more of something, or some of something else, we would be even better off than we are now. It could be more things like more money, more clothes, a bigger/better home, more or newer electronic gadgets, or a bigger or faster car. I have no doubt that you can think of few things that would make your life better right now! It’s not just things we want, though. We might want more time to do activities, more fame, more friends, more privacy, or more power. We always want more. Economists have a phrase for this aspect of humans: unlimited or insatiable wants. Unlimited wants by themselves aren’t necessarily a problem. After all, they provide the motivation for us to work and produce. By working and producing, we create more and better things that help satisfy those wants. What makes our unlimited longings into a real problem is another fact that economists observe: our resources are limited. Thus, an essential feature of the human condition is that we work and produce in order to satisfy our unlimited wants, but the resources we use to produce satisfaction are themselves limited. Economists have a name for this problem: the Economic Problem. The existence of the economic problem means that people, you and I, have to make some choices. We have to choose. Some wants won’t be be satisfied. Some will. The processes, interactions, and consequences of how people make these choices is what economists study. In other words, most economists define economics as “the study of human choice in the face of scarcity”. In modern society, markets are the social institution that is most often used to help people make these choices. It’s not the only way to coordinate people’s choices, but it tends to predominate. Therefore, much of modern economics can also be described as the study of markets and their effects. We haven’t really defined or described what a market really is (or isn’t) yet. Formal descriptions will come later. At this point, though, it is useful to think of a “market” as any group of people (or business organizations) that are free to buy and sell from each other. There’s no boss in a market. Everybody makes their own decisions and, usually, tries to improve their own condition. Introduce some basic principles (or concepts) and terms about how individuals make choices and about how markets work. As part of these principles, we want to discuss and define the basic problem of scarcity faced by all societies. Describe the basic methodology that economists use to analyze issues and reach conclusions. Use a production possibilities frontier (our first formal model) to illustrate several of the key principles and the basic methodology. The economic problem, the observation that people have unlimited wants but limited resources, means that people have to make choices. It is the foundation of modern neo-classical economic theory. Another way to describe the economic problem is to say that scarcity exists, or that resources are scarce. Some critics of modern neo-classical economics object to this foundation, the assumption of scarcity. They observe that not everything is scarce – some things can be produced in nearly unlimited quantities at nearly free costs, such as making electronic copies of files. Other critics object to the implication that people are or must be greedy. Both of these objections result from misunderstanding the issue of scarcity. When economists observe that people have unlimited wants, we are not saying that people are greedy. We are simply observing that people always think their condition could be improved. It doesn’t necessarily mean that they want more stuff, although that does describe a lot of people. Even a selfless saint is likely to feel that they would be better off if they had more time or money to help others. We can always imagine ways to become better off. Likewise, while it is true that modern technology has brought the cost of some items to nearly zero, and that there may be some resources, such as the sun’s energy, which are unlimited (or seemingly so), it doesn’t invalidate the “resources are limited” observation. Virtually everything we use to satisfy our wants requires a mixture of resources, and most resources are limited. If nothing, else, our time is strictly limited. We get 24 hours in a day. So even if you were the richest person in the world, you would have to make some choices. Even if you could buy any merchandise you wanted, you still need time to consume it. And time is limited. What we are going to study in microeconomics, is how people make choices, given these limited resources, in order to make their life as best as they can. What goods should we produce with our limited resources? How much of those goods should we produce (quantity)? How do we produce them? What technology or method? Who does the work? Who gets to consume the goods we produce and get the benefits? Societies create different rules, laws, and institutional arrangements to help decide these questions. Economists refer to these institutional and legal arrangements as an “economic system”. There are many economic systems. Strictly speaking, every country and society develops their own economic system as part of their culture and development. There are, of course, general patterns to economic systems. The better known economic systems you may have heard of are “capitalism”, “communism”, and “socialism”. These are very simplistic labels. There are actually many different varieties of capitalism and of socialism, for instance. For those that are interested, the course “Comparative Economic Systems” [ECON260 at LCC] looks at these many systems. In this course, we are going to study an institution that is common to many economic systems. We’ll call this the “market system”. A market system is one where individuals are free to trade goods and resources with each other. Further, individuals are free to make their own decisions about whether and what to trade based on their own objectives. Usually, a market system also involves some degree of private ownership of property, goods, and resources, although markets may still exist to some degree even in communist, socialist, or traditional systems. In modern industrialized societies, markets are pervasive feature of the economic system. In the U.S., for example, markets help determine the allocation of many resources and markets coordinate the decisions of millions of individuals. Even in the U.S., though, markets are not the only way to allocate resources, coordinate decisions, and answer the four fundamental economic questions. At least 40% (and some would argue over 50%) of U.S. economic resources are allocated according to government or political processes, not market processes. Also, the markets that do exist, vary greatly in how free they are and how competitive they are. Nonetheless, markets are fundamental to how most modern systems work, and therefore, markets and the individuals’ decisions that are involved are the subjects of this course. There are essentially four principles that form the foundation of micro-economic theories of individual decision-making. Actually these principles are really assumptions or observations about how people make decisions. Economists start by observing that people must make choices and that they can’t have everything they want. This is the Scarcity Principle and it follows logically from the Economic Problem we discussed above. We next observe that people incur Opportunity Cost (the second principle). The concept of Opportunity Cost is critical. It says that everything has a cost, even those things or activities that we don’t pay money for. For example, as most of you are (painfully?) aware, taking a college course is costly. There’s the obvious costs: tuition, the book, and, if you are online, a computer and Internet access. But suppose for one moment that somebody paid those money costs for you. Suppose you had an all-expenses scholarship. The course would still be costly. Why? Because it takes time and your time is scarce. There are other things you could be doing with instead of reading this course material (sorry to remind you of that!). But, since you chose to spend this time working on the course, you aren’t (and can’t) spend this time doing those other things. When you chose to spend this time on this course, you also chose to not spend this time on something else. That something else could have provided some benefits to you, but now you won’t get those benefits because you chose not to do that something else. Of course, you will get the benefits of taking this course such as an expanded mind, a step closer to a degree that will pay more money or yield a more fun job, increased knowledge, the fun of learning, etc. Now that we know people must make choices (Scarcity) and that every choice yields benefits and a costs (Opportunity Cost), we know that people make trade-off decisions. They compare the potential benefits to the potential costs. In neo-classical economics, we assume that people make “rational” decisions. This is the third principle, the Rationality Principle. In its simplest form, this is simply the assumption that people evaluate potential benefits and costs, and then choose whatever yields the greatest net benefit. In other words, we are assuming that people will never choose what they believe to be their worst option. They choose what they believe is their best option. Now I know we all know people who make what we think are stupid or bad choices. Some of us have even made some bad choices ourselves in our lives. This doesn’t negate the Rationality Principle. Keep in mind, that by assuming that people make rational decisions, economists are only saying that people evaluate the expected benefits. At the time we choose, we may well be wrong or mistaken about what the true benefit or cost will eventually be. Similarly, the Rationality Principle doesn’t say that we always do a conscious, in-depth evaluation of the costs and benefits. Sometimes our “rational” choices happen in a flash, such as when you enter a restaurant and choose the cheeseburger just because you “felt like a burger”. Of course, some decisions are detailed analyses of costs and benefits such as when a corporation decides whether to invest $400 million in a new plant. The same models, built on the same Rationality Principle can enable economists to model accurately the decision-making process. So now we have individuals making choices (Scarcity), incurring costs (Opportunity Cost), and choosing the best option (Rationality Principle). How do people evaluate costs and benefits? This is our fourth principle: Marginal Decisions. Economic models are built on an assumption that people make decisions “at the margin”. What’s “at the margin” mean? It means we make incremental decisions. We constantly keep asking ourselves “should I have a little bit more? or a little bit less?”. For example, the average American eats something like 75 pounds of ground beef each year. But nobody sits down on New Year’s Day and makes a plan for how much ground beef they want to consume that year. Imagine such a scenario: “Well 75 lbs. a year is 1.5 lbs per week, so I’ll be having cheeseburgers for lunch on Tuesdays and Thursdays and spaghetti with meat sauce on Fridays all year”. It’s silly. Nobody does it. So how do we get to 75 lbs.? We make many, many, many marginal choices. Everyday, at lunchtime you ask yourself: Am I hungry? Do I want to eat a quarter-pounder? When you say yes and order the quarter-pounder, you have made a marginal decision to increase your total consumption of ground beef by 1/4 of a pound. At dinnertime you’ll ask the same question, but likely come to different answer. Tomorrow you’ll ask the question again. When you add the accumulative effects of all these meal-time marginal decisions across the whole year, you get to the total consumption for the year. Similarly, when you drive you don’t plot the route out, choose an average speed, get in the car and put it on cruise control at that speed. Instead, you pay attention as you drive. When you drive, your mind is constantly looking around and asking itself: should I speed up? should I slow down? should I not change my speed? That’s marginal decision-making in action. And economists observe that most people make most decisions about consumption and production by making marginal decisions. These four principles, Scarcity, Opportunity Cost, Rational Choice, and Marginal Decisions, are the foundation of all the models in this course. You’ll see them in action throughout the entire course. Economics is a social science. That means it studies how people behave and interact. In particular, economists are concerned with two basic activities: consumption and production. Consumption is seen pretty much as the primary goal or objective of human existence. This doesn’t mean economists believe only in crass materialism. Rather, it says that the activities that humans want to pursue to make their lives better involve using and consuming goods and resources. These activities could be eating, reading, learning, being entertained, sport, meditation, caring for others, or even religious activities. Consumption is what we want to do (at least according to current economic theories). This also leads to the economists’ definition of “goods”. A good is any resource or thing that satisfies someone’s wants. A good does not have to be physical or tangible. A “good” can be a service. Generally when we say “goods” we really mean “goods and services”. Nor does a good have to be something that can be sold. Of course, most of the goods we will study are goods that are sold. If goods are thought of this way, it’s more reasonable to see why people always want more goods. They want to improve their lives by consuming them. Economists typically accept whatever goods people say they want without trying to pass any moral or normative judgements about whether they “should” want them or trying to explain why they want them. Why you want you what you want is a subject for psychology more than economics. Similarly, whether you should want those goods is more a topic for ethics, religion, or philosophy. Economists simply accept that you do want them. This need or desire to consume more is the “unlimited wants” portion of the economic problem. Of course, “limited resources” is the other part of the economic problem. But while our resources may be limited, we aren’t limited to using only the resources given us by nature in their natural state. We can change those resources to make them more useful or more beneficial to us. This process of converting resources into more desirable resources is the other human activity (as seen by economists): production. Production involves combining various different resources into more desirable resources. It’s a kind of input-process-output activity. Most of our models in economics assume that reason people produce (work) is in order to be able to consume more later. One of the frontiers of research in economics is exploring what happens if people want to work and produce just for the experience of producing. However, for purposes of this course, we will just go with the mainstream economics assumption that production is done solely to enable more and better production. Just about anything can be a resource in the sense that it can be used to produce a more desirable good. It is useful however to think of different types or categories of resources. Economists have traditionally divided all resources into 3 types: land, labor, and capital. Land is really a simple term referring to all natural resources. This means anything that is not man-made but occurs naturally. It could be land itself (like real estate or dirt). It could be minerals such as iron ore, gold, or oil. It could part of the atmosphere such as clean air. It could wild animals or plants or trees (like the rainforest). It can even be water such as rivers, lakes, and the ocean. [by the way, if you have a nosy parent/spouse/friend that keeps asking “what did you learn in economics?”, just tell them you learned that the ocean is really land. That should shut them up] One significant aspect of “land” or natural resources is that they really are limited: we only have what we have on the planet. We can’t make more. Labor is much simpler. It is simply human effort regardless of how it is compensated or who is doing it. Labor is interesting because it too is limited, but only in the sense that we are limited to the potential labor of all who are able to work right now. In the future, we could have more labor available by creating more people, but there’s a long lag time until the additional labor is available. I am not being silly here. Many people in rich, developed countries often criticize the high birth rates that occur in poor undeveloped countries. They think that if the poor countries had less population they would have more riches-per-person. But economists know that people aren’t just consumers. People are also a source of labor, a critical resource. In very poor countries, labor is often the only real resource they have. Capital is a term that is often used differently by economists than it is by everyday non-economists. In everyday language, “capital” usually refers to sums of money that get invested. Economists think of this as “financial capital”. Capital, to an economist (and to you for this course!) means goods that were produced in the past, are not used in consumption, but are being used to produce more goods now and in the future more efficiently. Capital then refers to tools, equipment, factories, plans, acquired skills, and inventory. Accumulating capital goods is one way society can improve on the economic problem. By making capital goods now (and forgoing some consumption now), we can have even more and better goods for consumption in the future. In recent years some economists have speculated that there is really a fourth type, but there is no agreement on that yet. The fourth type is sometimes called entrepreneurial ability, risk-taking, or just ideas. Economists also have some basic principles about what happens when the rational marginal decision-making individuals interact with each other. In other words, we have some basic principles about how markets work. I won’t go into as much detail about these principles here because, unlike the individual choice principles,these market principles are more like conclusions that we reach having built our models and tested them. The individual choice principles are observations of human behavior that become the assumptions upon which we build economic models. The market principles are more the generalized conclusions we reach after having built the models and analyzed them. Efficiency is a social goal – This follows from the Economic Problem: we want to make the most of our scarce resources. It should be noted that not all economists share the view that efficiency is more important than fairness (equity), but most neo-classical economists do. Trade is Win-Win – If we observe two rational people voluntarily trade or buy-and-sell from each other, we can safely conclude that both persons believe they will benefit from the trade, otherwise the person who thinks they are becoming worse-off would simply refuse to do the deal. Markets are Efficient – This is a very powerful, yet somewhat counter-intuitive conclusion. Yet, the results in the real-world are compelling. The best way to achieve the most efficient outcomes is to let people trade in a competitive market. Markets may look chaotic at first: nobody is in charge, nobody is planning, it appears that waste and duplication can happen. But the results inevitably show that competitive markets achieve greater efficiency than any form of centralized planning, private or government. It must be noted that to achieve efficiency, though, proper property rights must be defined, the markets must be competitive, and the right institutional (legal) environment must exist. Government has a Role – Governments have a role in creating the right legal and social environment where competitive markets can function. In addition, in those cases where markets don’t function well, government may need to be the mechanism for allocating resources. Models aren’t real. They are only small re-creations of the essential parts of something from reality. They leave out a lot of the “noise” and distracting elements and let us focus on the essential. Economists make models of economic life. We simplify so that we can better and more logically analyse what’s going on. In reality, buying, selling, trading, consuming, and producing are incredibly complex activities. Rather than try to describe all of the complexity of all these decisions and activities, economists try to simplify their descriptions of the activities. The intent is to bring attention and understanding to what are the really, really important influences or dynamics occurring. 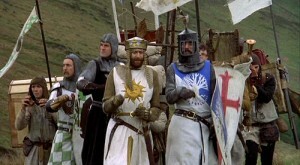 Of course, in simplifying, we leave things out, just like the horses were left out of the Monty Python Search for the Holy Grail movie. As it turns out, the horses weren’t critical. Movie watchers understood that the knights weren’t really walking everywhere. What was really important was what the knights said. So economic models are like movies. We all know they aren’t reality. But, they usually draw our attention to some particularly important aspect or dynamic or influence. As a result, we understand reality better by studying the models, or watching the movies. The models economists build are also sometimes called “theories”. Whether we call them models or theories, what they really are is simplified stories of what happens and what decisions get made by particular people under particular circumstances. Stories like: “what happens when the average grocery shopper goes to the store and finds out that the price of beef has increased by $0.50 per pound since the last time they shopped”. Or stories like: “what happens when 500,000 people want a Nintendo Wii game console for Christmas but Nintendo only has the ability to produce 250,000 consoles before Christmas”. In reality a lot happens in both stories. There’s likely to be a lot emotions, perhaps swearing, and in the case of the Nintendo, some people actually got shot. What economists are interested in, though, is what economic reactions did people have. What did they do with their scarce resources? To focus our attention the essential (and often hidden) dynamics of the story, we build models. Typically, a model (or theory) tells a story. The story can be communicated at least four different ways. We can actually tell or write a verbal story in words. These are easy enough for most people to understand, but telling verbal stories has a some weaknesses. It is easy to make logical errors or get confused when listening/reading a verbal story. It also takes a long time and a lot of space. So a second way we tell stories is by simply summarizing what happened as a table of data. We often call these tables “schedules”. For instance I could tell a story of the beef buyer above by noting that when Price= $2.00, Quantity purchased=4lbs. and when Price=$2.50, Quantity Purchased = 3 lbs. Data tables (or schedules) are precise, but most people find it hard to look over a table of data and quickly see the underlying relationships between variables. So we use a third way to describe our models and tell our stories: graphs. To be precise, we use X-Y coordinate graphs and draw “curves” that generalize the relationships between the variables and the data. Finally, economists increasingly use algebra and calculus to tell the same stories. Good news: we won’t use calculus in this course and we’ll use very few equations. What we are going to do most is to use stories and graphs to describe our models. This is why it’s worthwhile to brush-up and review how x-y coordinate graphs work as you start this course. What economists do with the models they build is test them and use them to make predictions. In other words, we build models of how people make decisions under certain conditions (such as when the price of beef goes up), so that we can generalize and predict how people will react when similar conditions occur in the future or some other situation (such as when the price of gasoline goes up). The best models in economics are the ones that most reliably predict people’s behavior. Of course sometimes, economists and policy makers don’t like how people will behave and they want to use the economic models to figure out how to get people to behave the way the policy maker wants. This leads to two types of economic analyses. We call an economic analysis or argument positive economics if it only attempts to accurately state or predict what is or will be under certain conditions. Positive economics attempts to be judgement-free on the part of the economist. Positive economics states conditions and then predicts behavior. Positive economics, for example, would predict that when twice as many people want a new game console as there are actual consoles available, that people will be unhappy, used consoles will jump in price, and somebody is going to get hurt. Normative economics evaluates the desirability of the outcome and proposes a way to prevent the undesirable outcome or cause a more desirable outcome. Normative economics depends heavily on the value judgements of the economist. A hypothetical PPC model for Food & Computers. 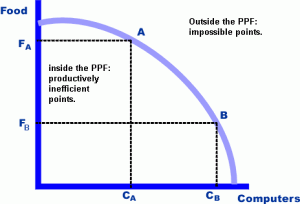 The Production Possibilities Frontier (PPF) is a relatively simple graphical model. It only has one curve. But it is extremely useful. First, it illustrates many of the basic principles we described above. For example, opportunity cost, scarcity, and marginal decision-making are all illustrated in this model (and others). It also describes other ideas such as economic growth and technology. The PPF model also helps us illustrate how economic ideas and theories can be communicated as either stories, or data, or as a graph. This is why we start our study of formal economic models with the PPF. As you will see when you work through the examples and the worksheet, a PPF model ultimately helps us understand why trade occurs. The PPF defines the limits of what is possible for people to consume when they produce all of their own goods from their limited resources. When we look at the PPF’s of two different people and find that the curves are different, we know that the two people have different opportunity costs. And when people have different opportunity costs, then comparative advantage exists. And comparative advantage is basis of trade. People trade because trade makes it possible to consume quantities beyond what they can produce themselves. The pattern that determines who produces which good and trades it is comparative advantage. This is true of simple two-person scenarios such as we will study in this chapter, and it’s true for large economies with millions of people, and it’s true for trade between the people of different nations. The PPF will only tell us who might trade with whom and what each will produce and trade. It will also give us a range of relative prices. Relative prices are the rates at which two commodities are traded, such as “I give you 2 chocolate chip cookies for each coconut macaroon you give me”. The relative price is 2 choc.chip= 1 macaroon. It can also be stated as 1/2 macaroon = 1 choc chip. At this point we can’t predict the exact actual price. But in the next unit we will. In the next unit we will study the demand-and-supply model, the most famous economic model.